We wanted to let you know Dory has been going downhill for the past 2 days. We took her to the vet on Thursday where they aspirated almost a liter of liquid from her abdomen and gave us new heart meds. She hadn’t been eating well when we took her, and the vet thought she would get her back to eating after draining the liquid from her tummy. To our dismay, with the exception of a few bites of chicken on Friday morning, she isn’t interested in food at all. Not even Zukes or Greenies. We even tried an appetite simulator yesterday afternoon with no results. Late Saturday afternoon Beth emailed me that it was clear that Dory had tried her best but she was too tired to fight any more. Saturday night they spent the evening surrounding Dory with LOVE. Today April 9, at 9:30 am PST, Ed and I will be with Dory to help her make her journey across the Rainbow Bridge. it is with tears running down my face that I read this about our precious Dory. prayers going up for Dory and her family... I love you Dory. (¸.•´ (¸.•` ¤God speed to this most special beautiful girl who will not be forgotten, and remembered with lots of love! We are so sorry to hear this. We're sending purrs and prayers to you through leaky eyes. Fly Free Dory. We will always remember Dory as our sunshine on Blogville. She was such a sweetheart. Hugs and love to all of you, 2 legger and 4! Our hearts hurt too. We are honored to have known Dory. She was beautiful inside and out! She has spread her joy to many and will be missed for a very long time. Our hearts break for her family. Oh no - this wuz so unx-pected. 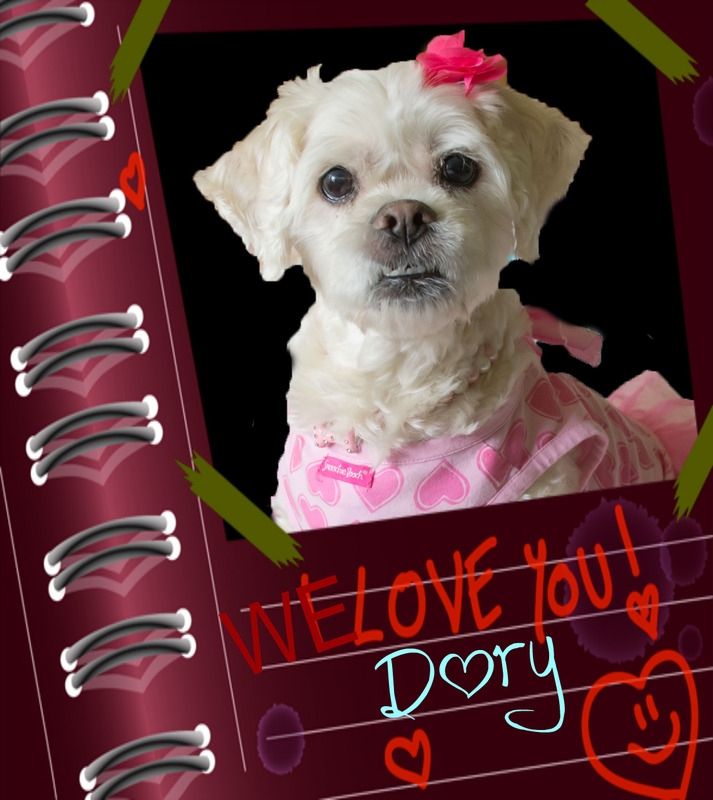 Dory iz such a joy in Blogville an'will b sorely missed by all - her family most of all. Wish we cood all b there with u tue send off dear Dory. Me an'mom send prayerz an'POTP fer all thoze left b-hind. 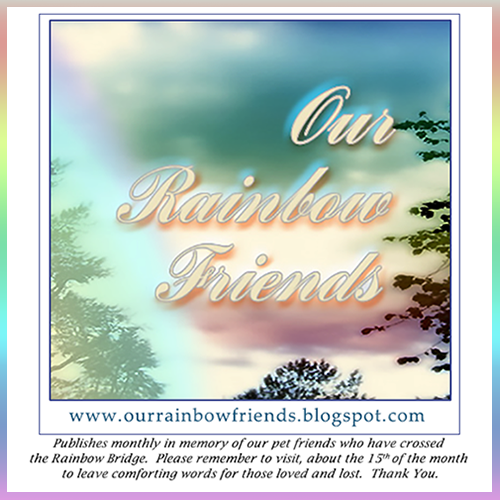 Run free dear little Dory - scamper up tue the Rainbow Bridge - Angel Shiloh an'Angel Oreo will b there tue welcome az well az all the other Blogville rezidentz who haf gone on b-4 u. We are just devastated to hear about Dory. Our tears are flowing too - she is just such a sweet little girl. Hugs to Beth and the family. Our best to the family and friends of Dory. Tears here too, for Dory, a dog we have never met but loved so much. Sending love and hugs to Beth and all the family. Oh no! Not our dear friend Dory! We're sending lots of hugs and POTP to her family and hope she makes a peaceful trip across the Rainbow Bridge. Joey, Miss Ginger, and Charisma will be waiting to meet her there. I just returned home from Palm Sunday service so uplifted and now have tears upon my face. Dory made our lives extra special and truly showed this community the true meaning of love. We hated to see the news when we finally got online today. We know her family's hearts are broken. Our tears have been flowing. Warm hugs for her family. We were so sad to see this news. She will be missed by all. I just never expected this today and it's so heartbreaking. All of Blogville will remember her with love. So so very sorry for your loss. Hugs and so very sorry for your grief. Our hearts are hurting right now. We love you Dory. Rest well at the Bridge sweet girl.